London When privatization of public services is ubiquitous, it’s actually kind of scary, as I just witnessed in England and Scotland. Catching a train from Edinburgh to London, I did a double take when I saw a pink Virgin train rolling down track 3 towards me as I waited to jump from Haymarket to the Waverly station in Edinburgh. Once in the massive, old Victorian looking station at Waverly there seem to be a smorgasbord of different companies before I ended up plopping down into a seat on a train called East Coast thanks to the help of someone with First on their jacket and Robert on their nametag, all of which were various private companies I’m sure. 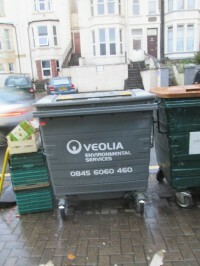 In London, I did a triple-take at seeing small garbage dumpsters, or bins as the locals call them, with Veola’s name all over them and that was true of a number of garbage trucks there as well. Our union of course has an agreement with Veola as the private company managing the bus and ferry services in New Orleans making it not so much a small, as a scary, world of privatization gone wild. Of course the ideology is about competition on both sides of the water, and doubtlessly it rings equally hollow on each shore, but with differences. In London, when I was doing my first day of community organizer training I started to give an example of picking appropriate tactics tailored to the target and used the example of not hitting the meter reader with everything you have when you want to save that for the utility company. The blank stares quickly educated me to the fact that even when it comes to utilities, they have choices in England between a half-dozen or more companies with correspondingly different prices. Cell phone and internet service? Yes, you guessed it, cheaper and of course much faster. The slowest service my friends in Scotland were explaining is almost the fastest premium service for businesses in the US. A piece in the Times, I scanned quickly as I ran for Heathrow today, should be must reading for both weak kneed FCC and our straight backed Attorney General Eric Holder. The reporter looked at the impact for consumers – wow, that’s radical already! – of the FCC rejecting the merger of T-Mobile and AT&T, and then ticked off the examples of how, following the rejection, T-Mobile has essentially turned the cellphone market upside down by cancelling 2-year mandatory contracts and pretty much anything else that has been a burr in the saddle of millions of consumers. And the result? Well, they are growing and for consumers it has forced prices to begin falling because, voila!, there’s real competition rather than monopoly pricing. Finally, they are even “breaking the bundle” and separating phone from data services, which has been a personal bugaboo of mine for years now. Underlining the point, this is a shot across the bow at the arrogant, money walks, everyone else just talks, stance that Comcast has taken to snubbing its nose, and lobbyists, at any talk of the obvious monopoly it is expanding, by thumbing its nose at both the government and the consumers, with its effort to buy Times-Warner and strangle the internet and lock the door behind them. If it worked for cellphones, why not cable? This entry was posted in ACORN International, Citizen Wealth, Financial Justice, International, Labor Organizing, Organizing and tagged competition, England, monopoly pricing, privitization, Scotland, UK by Wade. Bookmark the permalink.